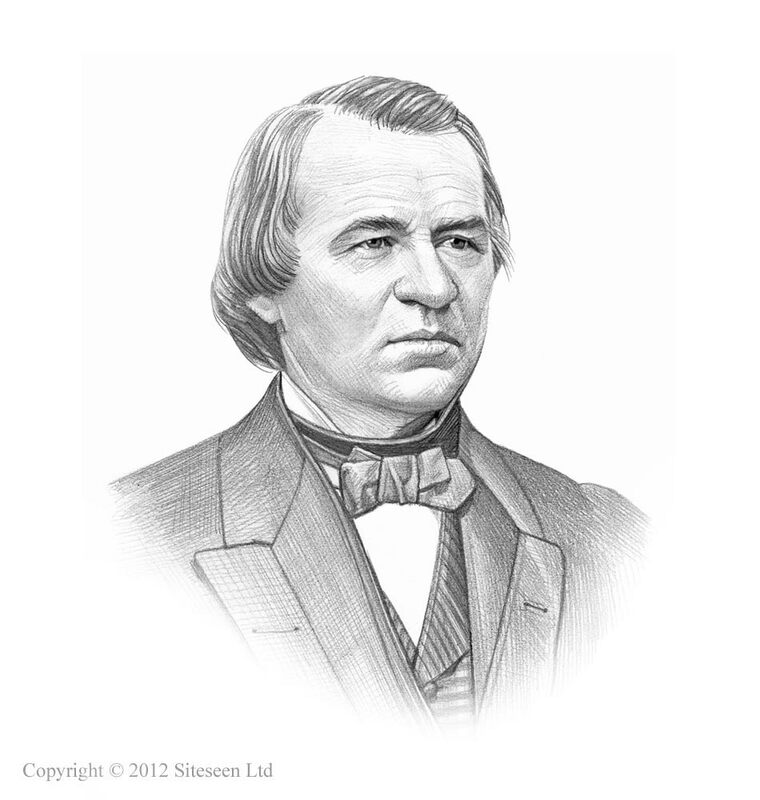 Scalawags: Andrew Johnson was the 17th American President who served in office from April 15, 1865 to March 4, 1869. This article provides facts and information about the Scalawags during the Reconstruction Era following the Civil War. Summary and definition: The Scalawags were native to the Southern states and sought to gain financial and or political power following the Civil War during the Reconstruction Era. Scalawags had previously resented the wealth, social standing and the power of the planter elite. Many Scalawags had been raised in poverty and were not slave owners. They gained power as Southern Republicans which they shared with the Carpetbaggers who all originated in the North. Why were Scalawags called Scalawags? How did the Scalawags get their name? The name is a derivation of the old English word 'rapscallion', a low, common, deceitful, good-for-nothing creature, also related to the word 'Scallywag' meaning rogue or scoundrel. The name of Scalawags completely encompassed the view of these people from the perspective of loyal Confederates of the 'old school'. The Scalawags were loathed as being treacherous and evil without honor or virtue - ready to pillage, plunder and completely destroy the South. The end of the Civil War was a time for great political change and for many it was a time for exploitation. Unscrupulous, Southern born people were looking to exploit opportunities for financial gain and personal political power as Southern Republicans - these were the men and women referred to as the 'Scalawags'. In general, the Scalawags came from a lower social class to the planter elite and had come from a much less wealthy background, did not own slaves and always resented the power, and were hostile to, the old Confederacy. The end of the American Civil War led to the Reconstruction Era which lasted from 1865-1877. New state governments and economies were established during this period and the infrastructure of the South had to be rebuilt. Life in the South was turned upside down. The Power in Southern politics changed from the Democrats and was controlled by Republicans. Freedmen (ex-slaves) also held political offices. What is the Difference between Scalawags and Carpetbaggers? The Scalawags were people born and bred in the South. The Carpetbaggers came from the North after the defeat of the South in the Civil War and the fall of the Confederate States of America. The Carpetbaggers were so-called because they arrived in the South carrying a carpetbag, a common type of travelers bag, made out of scraps of carpet. Both the renegade Scalawags and the alien Carpetbaggers had the same objectives during the Reconstruction era - to get rich by exploiting the South and its people or gaining power through political advancement. What did the Scalawags do? The Scalawags turned on their own kind and were deemed as traitors to the South, cooperating with the Republicans for the same reasons as the Carpetbaggers. Their purpose was to seek personal financial gain or power through political advancement. The Scalawags were looking for money or power. The American Civil War had taken its toll on the people of the South. The Union Blockade had prevented the plantations and farms in the South from selling their produce - cotton exports (the mainstay of the economy), fell to 2% of their pre-war volume. The Confederacy had been forced to raise money by borrowing from its citizens in exchange for Confederate bonds. The Confederate government issued over $150 million in Confederacy bonds, none of which was ever repaid. The CSA also printed about $1 billion dollars which was not backed by gold which led to high inflation - Confederate dollars were only worth about $.05 in gold. Many Southerners were ruined, once rich were now poor. The Southerners had no money to pay the new property taxes. The Southern states was economically devastated and ready for the Scalawags to step in. What did the Scalawags do? Perfect examples of the exploitation practiced by the Scalawags were given in the famous Margaret Mitchell novel, subsequently made into a movie "Gone with the Wind". One of the characters, Rhett Butler, had made vast amounts of money as a blockade runner. Another character, the Southern belle Scarlett O'Hara was portrayed as unscrupulous throughout the story. She married a loyal Confederate man who had made money from a store and had a lumber yard as a sideline. The Scalawag, Scarlett O'Hara, insisted on calling all debts from old Confederate friends and extended the lumber yard - at the time of Reconstruction there was massive re-building projects. Cheap labor had been made available by the Vagrancy Laws and Convict Leasing and Scarlett O'Hara exploited the convicts and the need for lumber. What did the Scalawags do? The Scalawags were looking to gain political power in the new Southern state governments as Southern Republicans. Southerners had attempted to restore self-rule but failed. The Black Codes had been over turned by Congress. Former Confederate leaders and military personnel were temporarily banned from both voting and holding political office in the South. The ex-slaves were given the right to vote, run for public office and participate in the new state governments. The black vote provided the means for the Southern Republican Scalawags to acquire political power. The Freedmen became the political allies of the Scalawags and the Carpetbaggers. White Southerners with Republican sympathies joined forces with Northerners to run the South. Once elected to office the Scalawags had the power to pass new laws and to grant lucrative contracts for the re-building of the South. Corrupt Scalawags made a fortune from accepting bribes and making the most of money making opportunities. How did Scalawags affect Reconstruction?